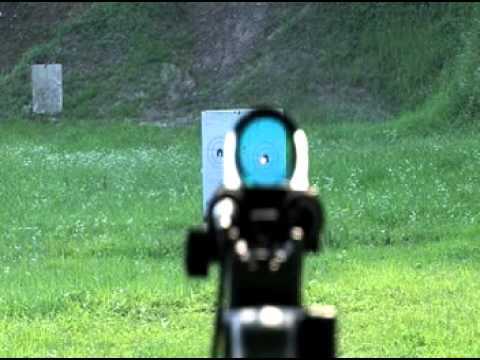 Unlike conventional optics, a red dot reflex site uses a small dot illuminated by a LED with a non-magnification lens that allows a shooter to aim the target with both eyes open. D.I. Optical’s red dot sights allow two different shooters to use the same optic which will have the same zero point immediately, no re-zeroing required. Our optics have been tested in the lab and proven in combat. D.I. Optical’s optics meet or exceed the physical endurance requirements of military forces throughout the world. Each D.I. Optical sight is CNC machined from a solid block of 6061-T6 quality aircraft aluminum, then Type III hard anodized to military specifications. Shorter eye relief allows the shooter to have wider and increased viewing angle (10° increased angle at 10 cm close). By moving shooter’s head to the left and right, the viewing angle reaches wider, about 38°, and allows the shooter to have an even wider field of view. Accurate aiming for pin-point shooting. Springs absorb the shock of every round and bring the sight back to the original position. Turn the Brightness/OFF switch clockwise to select the reticle brightness level, from 3 night vision, 3 twilight and 5 daylight settings. With its wide field of view, a shooter can respond quickly to rapidly changing situations.2x MagnificationIn shooting the long distance target in 300 m or farther, 2x magnification lens has comparative advantage against a no magnification lens.Analysis of shooting range in real combat situation using rifles. – Percentage of Shooting at less than 250 m range > 85 %- Percentage of Shooting at less than 350 m range > 88 %- Percentage of Shooting between 250 m and 350 m range > ONLY 3 % !